GEFS+, meet CNV. Microduplications at 17q12 have been identified in various neurodevelopmental disorders and in some unaffected individuals, a pattern familiar from other structural genomic variants such as microdeletions at 16p13.11 and 15q11.2. In contrast to the corresponding microdeletion, most 17q12 microduplications are inherited. This suggests that the microduplication is a risk factor, but does not fully explain the phenotype. In a recent paper in Neurology, Hardies and collaborators look at the families of 17q12 microduplication carriers with epilepsy. And this is when they noticed something strange. The 17q12 microduplication syndrome. For structural genomic variations, there are always two opposite narratives. The first narrative is the story about the phenotype and the particular features of the corresponding syndrome. The 17q12 microduplication is a so-called genomic disorder. This means that the duplication arises in a part of the human genome that is prone to deletions and duplications due to particular features of the local genomic architecture. The 17q12 microduplication syndrome was first delineated in 2006 by Sharp and collaborators. Further follow-up studies suggested that intellectual disability, dysmorphic features, epilepsy and in some cases renal malformations constituted the features of this syndrome. In contrast to other microdeletions such as the 15q13.3 microdeletion, deletions and duplications at 17q12 are very rare. In patients with intellectual disability, the frequency is roughly 1:1000. This is ten times less frequent than other microdeletions seen in patients with epilepsy. The risk factor story. The other narrative revolves around the fact that this microduplication is sometimes seen in controls and is usually inherited from unaffected parents. In a large cohort, Kaminsky and collaborators found this duplication in 4 out of 10,000 controls. While this seems negligible, the duplication was also only found in 21 out of 15,000 patients. This results in an odds ratio of 3.5. While an odds ratio is always an abstract figure, penetrance is more concrete: Given that there is only a roughly threefold increase in frequency in an otherwise rare disease (p=0.01), most carriers of this duplication will be unaffected. The penetrance of the 17p12 microduplication is ~3%, i.e. 97 out of 100 individuals carrying this duplication will be unaffected. With this chastening realization, family studies in microdeletions with related penetrance estimates such as 15q11.2 or 16p13.11 are usually a major disappointment. These variants usually do not segregate. But the picture in the families of 17p12 microduplication looks different. GEFS+. Genetic (Generalized) Epilepsy with Febrile Seizures Plus is a familial epilepsy syndrome with fever-associated epilepsies as the core phenotype. Mutations in SCN1A, SCN1B or GABRG2 have been identified in some families, particularly large families with monogenic inheritance. The concept of GEFS+ as a familial epilepsy syndrome with variable presentation in an individual patient was very influential in epilepsy genetics as it allowed for the discovery of the first genes for human epilepsies. 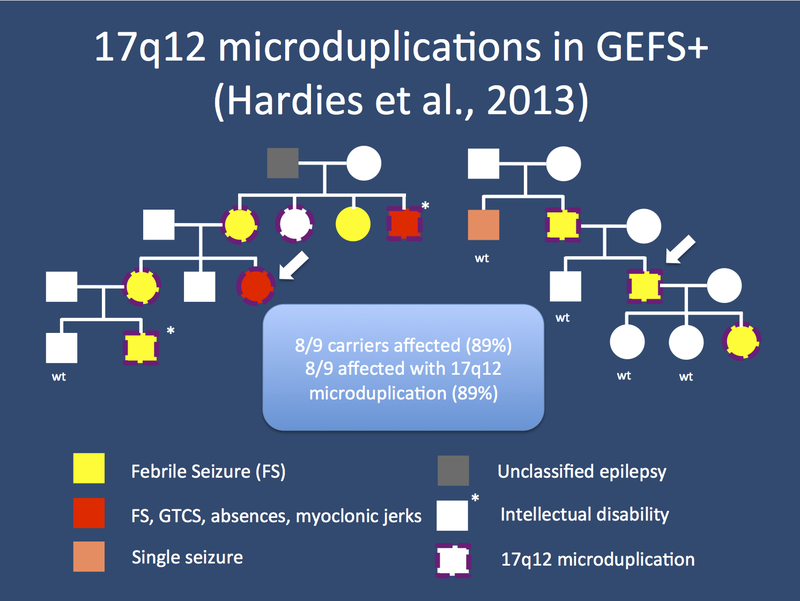 When Hardies and collaborators investigated the family history of patients with 17q12 microduplications and epilepsy, they stumbled upon families with a GEFS+ phenotypes. Simple Febrile Seizures was one of the main phenotypes in the two families. Also, the segregation pattern in these families was much more straightforward than would be expected from a structural genomic variation that merely increases the risk by a factor of three. Explanation. Family studies in microdeletion carriers are usually frustrating due to the irregular behavior of these variants in families. This story seems to be completely different in 17q12 microduplications once simple FS are added to the familiar phenotypes. The penetrance in families of 89% is much higher than the expected penetrance on population level of 3%. It is not immediately clear where this huge difference originates. However, the Febrile Seizures in the relatives without additional features may be the solution. These milder phenotypes may go unreported in large databases and might only be picked up when carefully analyzing a family. Therefore, the 3% based on population estimates might be a vast underestimate. Consequences for EuroEPINOMICS. The paper by Hardies and collaborators combines the previously distinct genes of family studies and copy number variation analysis, which is usually performed in single patients. Their study reminds us that we should keep exploring unconventional reasons for familial aggregation and that structural genomic variants may have a broader spectrum than initially expected. This entry was posted in 2013, Familial epilepsies, Meetings and tagged 17q12 microduplication, CNV, copy number variation, familial aggregation, familial risk, GABRG2, GEFS+, Genetic Epilepsy with Febrile Seizures Plus, genomic disorders, SCN1A, SCN1B, structural genomic variant. Bookmark the permalink.